Mato Grosso do Sul ([ˈmatu ˈɡɾosu du ˈsuw]) is one of the Central-Western states of Brazil. Its total area of 357,125 square kilometers, or 137,891 square miles, is roughly the same size as Germany. Neighboring Brazilian states are (from north clockwise) Mato Grosso, Goiás, Minas Gerais, São Paulo and Paraná. It also borders the countries of Paraguay, to the southwest, and Bolivia, to the west. The economy of the state is largely based on agriculture and cattle-raising. Crossed in the south by the Tropic of Capricorn, Mato Grosso do Sul generally has a warm, sometimes hot, and humid climate, and is crossed by numerous tributaries of the Paraná River. The state is also known for its natural environment, and is a destination for domestic and international tourism. 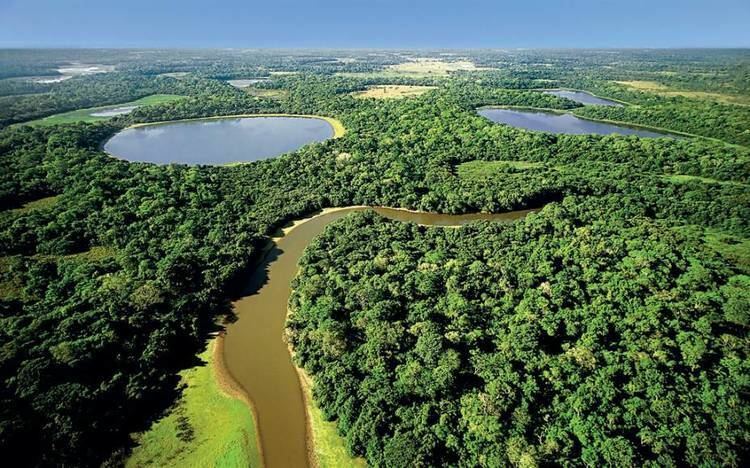 The Pantanal lowlands cover 12 municipalities and presents a variety of flora and fauna, with forests, natural sand banks, savannahs, open pasture, fields and bushes. The city Bonito, in the mountain of Bodoquena, has prehistoric caves, natural rivers, waterfalls, swimming pools and the Blue Lake cave. The name Mato Grosso do Sul literally means "Thick Bushes of the South" in Portuguese, a name inherited from its northern neighbour state of Mato Grosso, of which it was part until the 1970s. It is not uncommon for people to mistakenly refer to Mato Grosso do Sul as simply "Mato Grosso". Other names that were proposed, at the time of the split and afterwards, include "Pantanal" (a reference to its best known geographical feature) and "Maracaju" (a reference to the Maracaju Mountain Range that crosses the state from north to south). Mato Grosso do Sul has humid subtropical and tropical climates. The average annual rainfall is 1471.1 mm. January is the warmest month, with mean maximum of 34 °C (93.2 °F) and minimum of 24 °C (75.2 °F) and more rain; July experiences the coldest temperatures, with mean maximum of 25 °C (77 °F) and minimum of -2,0 °C (28 °F) and sun. The "cerrado" landscape is characterized by extensive savanna formations crossed by gallery forests and stream valleys. Cerrado includes various types of vegetation. Humid fields and "buriti" palm paths are found where the water table is near the surface. Alpine pastures occur at higher altitudes and mesophytic forests on more fertile soils. The "cerrado" trees have characteristic twisted trunks covered by a thick bark, and leaves which are usually broad and rigid. Many herbaceous plants have extensive roots to store water and nutrients. The plant's thick bark and roots serve as adaptations for the periodic fires which sweep the cerrado landscape. The adaptations protect the plants from destruction and make them capable of sprouting again after the fire. 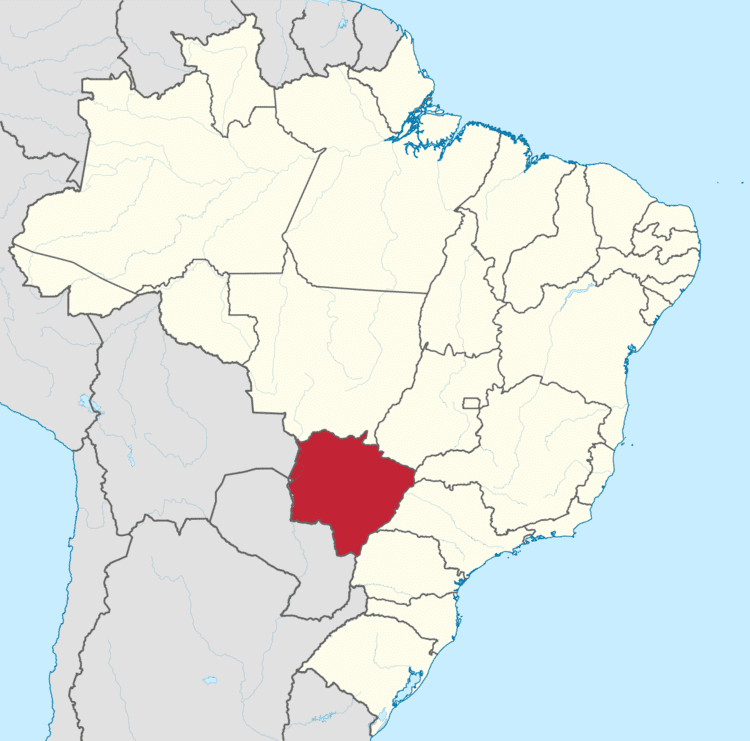 The state is located in western Brazil, in a region mostly occupied by the inland marshes of the Pantanal. The highest elevation is the 1,065 m high Morro Grande. The first peoples or indigenous peoples of Mato Grosso do Sul, particularly occupying the Nhande Ru Marangatu tropical rainforested area, are the Guarani-Kaiowá, first contacted by non-indigenous peoples in the 1800s. In October 11, 1977, the state was created by dividing the state of Mato Grosso. Its status as a state went into full effect two years later on January 1, 1979. The new state also incorporated the former territory of Ponta Porã and the northern part of the former territory of Iguaçu. According to the IBGE of 2008, there were 2,372,000 people residing in the state. The population density was 6.4 hab./km². The last PNAD (National Research for Sample of Domiciles) census revealed the following numbers: 1,157,000 White people (51.78%), 1,056,000 Brown (Multiracial) people (44.51%), 122,000 Black people (5.15%), 20,000 Amerindian people (0.84%), 15,000 Asian people (0.64%). In the Cerrado areas, mostly in the south, central and east, there is a predominance of Southern Brazilian farmers of German, Portuguese, Italian and Slavic descent. According to an autosomal DNA study from 2008, the ancestral composition of Mato Grosso do Sul is 73,60% European, 13,90% African and 12,40% Native American. According to a 2013 DNA study, the ancestral composition of Mato Grosso do Sul is: 58.8% European, 25.9% African and 15.3% Amerindian ancestries, respectively. The service sector is the largest component of GDP at 46.1%, followed by the industrial sector at 22.7%. Agriculture represents 31.2%, of GDP (2004). Mato Grosso do Sul exports: soybean 34.9%, pork and chicken 20.9%, beef 13.7%, ores 8%, leather 7.4%, timber 5.1% (2002). Share of the Brazilian economy: 1% (2005). There are more than 44 universities in whole state of Mato Grosso do Sul. It's a film festival held annually in the months of January and February and has been arranged since 2004. It focuses on the independent cinema presenting Brazilian films and foreign films as well. It also presents regional films and short films. As of 2011 the festival is suspended. 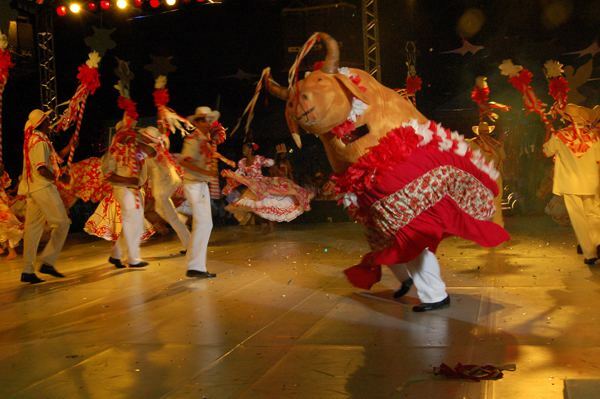 "Festival de Inverno de Bonito" (Bonito Winter Festival) is held every year for a week during July or August, with music performances and ecological videos, theatre, folklore and fine arts exhibitions. Aquidauana's biggest event is the Pantanal Micareta, which attracts thousands of tourists to Dr. Sabino Avenue, annually. Concentrations of lime in the soil around the area where Bonito is located is responsible for the transparency of the waters and for the existence of a wide variety of geological formations. Local activities include diving in caverns, observing the underwater fauna and walking along trails in the forest. Places like Gruta Lago Azul (Blue Lake Cave) and the Fazenda Estancia Mimosa, Aquario Natural (Natural Aquarium), and the rivers Sucuri, Prata, and Formoso, are popular. 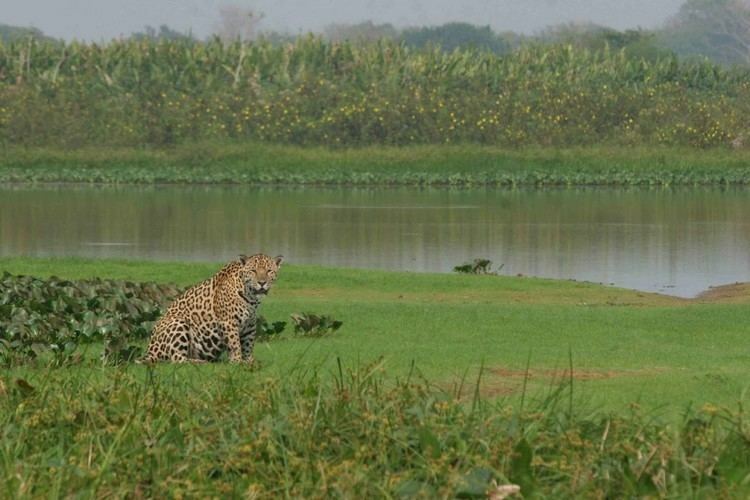 The Pantanal is an ecological destination in the heart of Brazil. It is the largest flooded lowland on the planet and the third largest environmental reserve in the world. It is home to one of the richest ecosystems ever found to date, with periodically flooded seasonal forests. It displays the largest concentration of neo-tropical fauna, including several endangered species – mammals, reptiles and fish – and it also serves as habitat for a variety of native birds, as well as those migrating from other areas in the Americas. The Pantanal is one of the best places in Brazil for flora and fauna observation and for fishing – permitted only between March and October – due to its abundance of animals. It has a total area of 230,000 square kilometres, covering 12 townships in the States of Mato Grosso and Mato Grosso do Sul. To the North, there are the Paracis, Azul and Roncador mountains. To the East, the Maracaju Mountain Range. To the South, the Dodoquena Mountain Range. And, to the West, the Paraguayan and Bolivian swamps. The Pantanal is so diverse that researchers subdivided it in sub-regions. 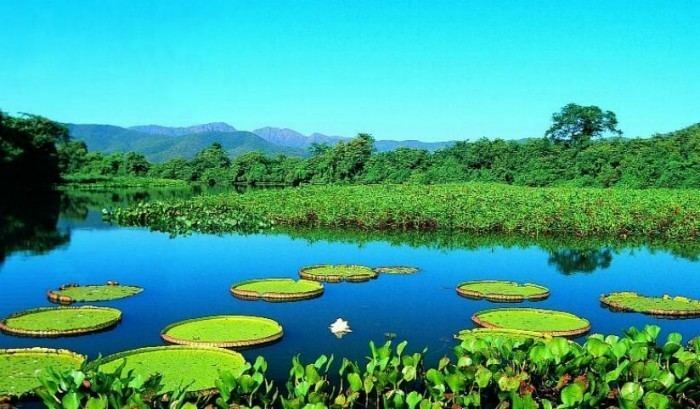 Each "Pantanal" – North and South – has its own natural features, activities and ideal period for visitation. Campo Grande - The operation of Campo Grande International Airport is shared with the Campo Grande Air Base. The airport has two runways. Construction of the main runway, made of concrete, began in 1950 and was finished in 1953. The passenger terminal was concluded in 1964, and in 1967 concrete aprons were built for both military and civilian aircraft. As commercial aviation demand grew, it became necessary to widen the civil aircraft apron, which was completed 12 years after its construction. The airport has been administered by Infraero since 1975. Corumbá - Corumbá International Airport, located just 3 km (1.86 mi) from the city center, was opened on September 21, 1960, the city's anniversary. Built on a land plot of 290 hectares and at an elevation of 140 meters above sea, it has an asphalt runway measuring 1660 x 30 meters, with one of its thresholds reinforced with concrete for an additional 60 meters. Corumbá International Airport has been administered by Infraero since February 1975. Ponta Porã - Ponta Porã International Airport is also administered by Infraero. Campo Grande was one of the 18 candidates to host games of the 2014 FIFA World Cup which will take place in Brazil. It did not make to the final list, being one of the 5 cities left off. Maceió gave up its bid before the end of the process. Mato Grosso do Sul's flag was designed by Mauro Michael Munhoz. A white stripe divides an upper left green corner from a bottom right blue space with a yellow star. 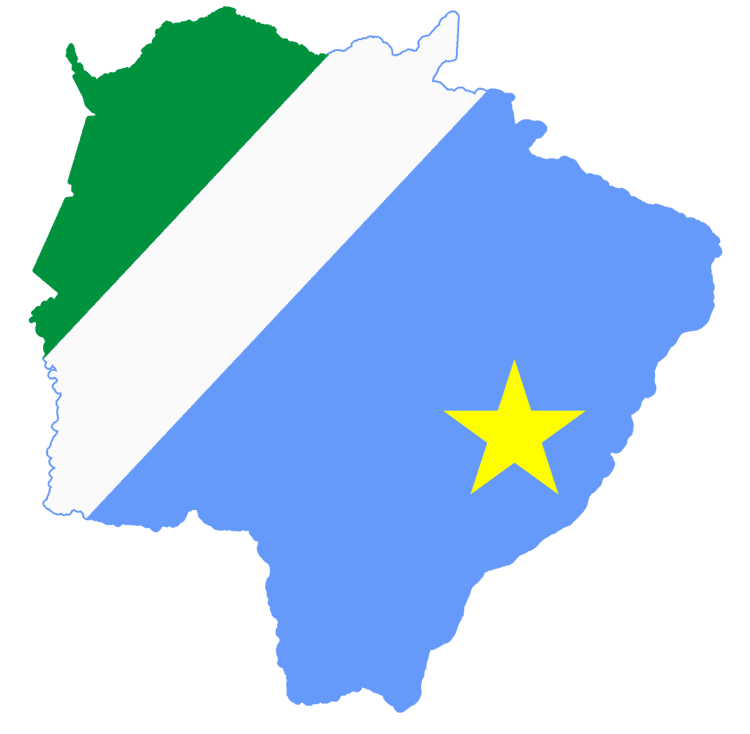 White symbolizes hope, green is an allusion to the state's rich flora, blue represents its vast sky, while the yellow star adds balance, force and serenity.The star on the flag is Alphard, the brightest star in the constellation Hydra.